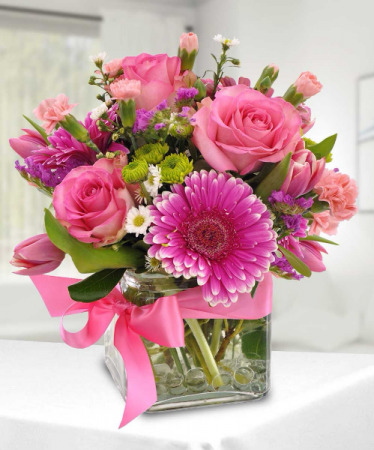 A delightful mix of pink tulips and roses with hot pink Gerbera daisies accented with pink mini carnations, purple statice, and white Monte Casino in a clear glass vase. Every shade of purple in our radiant bouquet will bring joy & delight to the people you love. 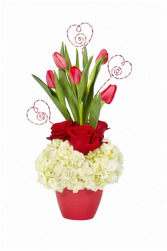 A rich gathering of blooms, hand-arranged by our skilled florists with lush greenery inside a glass vase. One look will be all it takes to turn their day around! 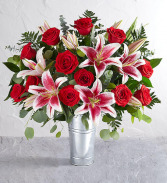 Red roses with stargazers nicely arranged in a silver vase with baby and dollar silver eucalyptus.